Things got better after the last blog entry. Wildlife rehabilitation is a constant roller coaster of emotions. The kind words of support from blog readers were appreciated so much. For those of you that wonder how or why we keep doing this work, I can only say we keep on going trying to make a difference for wild ones, educate those who are unaware, and bring situations to the attention of the public that may otherwise be perceived as a fluke or rare happening. People need to know what is illegal or even abnormal behavior in folks they may know. Years ago it was all left to a state agency to intervene on the behalf of wildlife. Those days are fading as state and federal funding for wildlife issues is cut. Wildlife belongs to all of us. It is up to the collective "us" to have a responsible role in protecting it. I am in no way suggesting you take up weapons and patrol, but being aware and proactive is important. 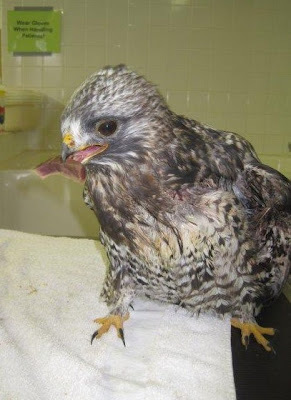 When I left you last the condition of the Rough-legged Hawk was grave. We pulled out all the stops in hopes this gentle bird would survive. I have good news. While very fragile and in critical condition, he is still with us. He has actually has eaten a few pieces on his own. We are a long way from celebrating, but things are looking up. 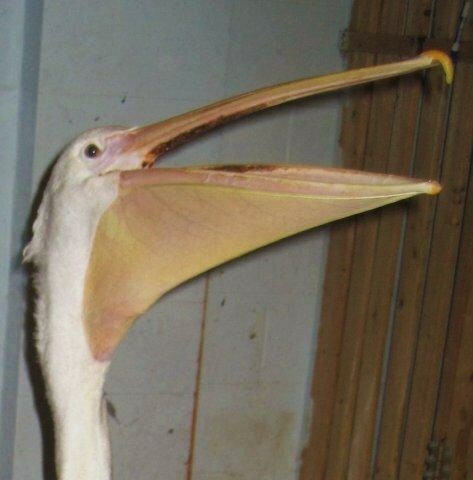 I wish I could share this bird with everyone. His gentle nature is touching. As birds of the far north, these hawks have often never seen a human. They are curious and unafraid of people, which is not to their benefit around those that are unethical. We have more good patient news. 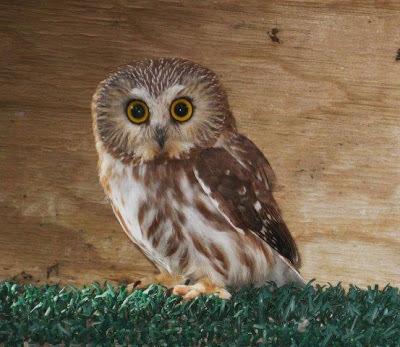 The Saw-whet Owl hit by a car west of Wausau a week ago has been in an outdoor flight. He is self sufficient in the flight, eating and flying and gaining strength and has maintained his weight. We hope for a release early next week. The male Ruffed Grouse ( x2) are well and nearing release. We have had a bit of a run on male Ruffed Grouse as the mating season begins in earnest. The males in particular seem to have much on their mind and are not paying attention to things like walls or windows. The female Ring-necked Pheasant from Wausau is using the leg that was broken when she arrived and is eating on her own. Her internal injuries are resolving well. We have some great news from some former interns as well. 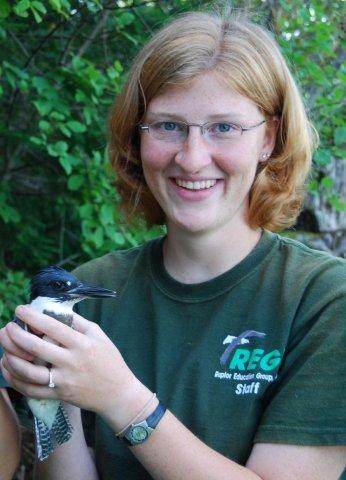 Jamie Klemish, a REGI summer intern in 2008, is now a Fulbright Scholar! 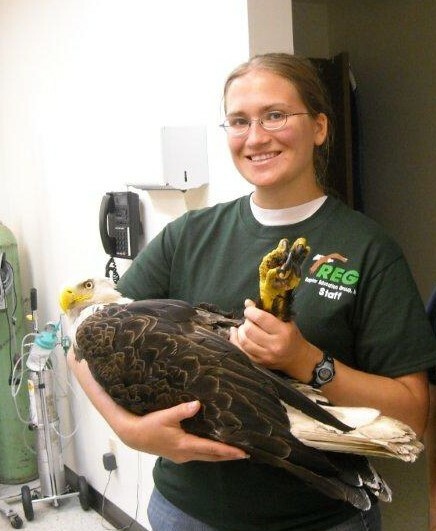 Liz Ferderbar , a student at University of Minnesota, just wrote to say she was accepted to Veterinary School in CA. Liz spent an abbreviated summer internship in 2009. Congratulations ladies! I brag that REGI interns are the absolute best. I'm not kidding. I have proof!